Molly was diagnosed with a heart murmur when she was eight years old, but remained a happy, active dog with no signs of her condition for a long time. One week before she went into congestive heart failure, she took a five mile 3 hour walk. Unfortunately, on Sept 11, 2018, Molly began having difficulty breathing. We rushed her to animal ER where we were told she had congestive heart failure with fluid in her lungs and a severely enlarged heart. We were told she had a short time to live, would need to be on medications for the rest of her life, and that there was absolutely nothing we could do. Fortunately, we found Dr. Simon Dennis at Hope Veterinary Specialists. He adjusted her medications to the appropriate dosage (the meds from the ER doctor were too high of a dose) and informed us there were surgical options. Without surgery, Molly was given approximately 8-12 months to live. We immediately contacted Royal Veterinary College in London and were able to schedule a surgery date of January 28, 2019. Molly remained stable on Vetmedin, Enalapril and Lasix along with a number of supplements during the five month wait for her surgery date. She also remained very active, walking as far as we would allow and playing as much as we'd permit. We found Mighty Hearts Project as well, and were able to get very helpful advice that helped us prepare to go to the UK. On the Wednesday prior to her surgery, Molly flew with us from Tampa, Florida to Washington Dulles to Heathrow. She enjoyed her flight greatly. 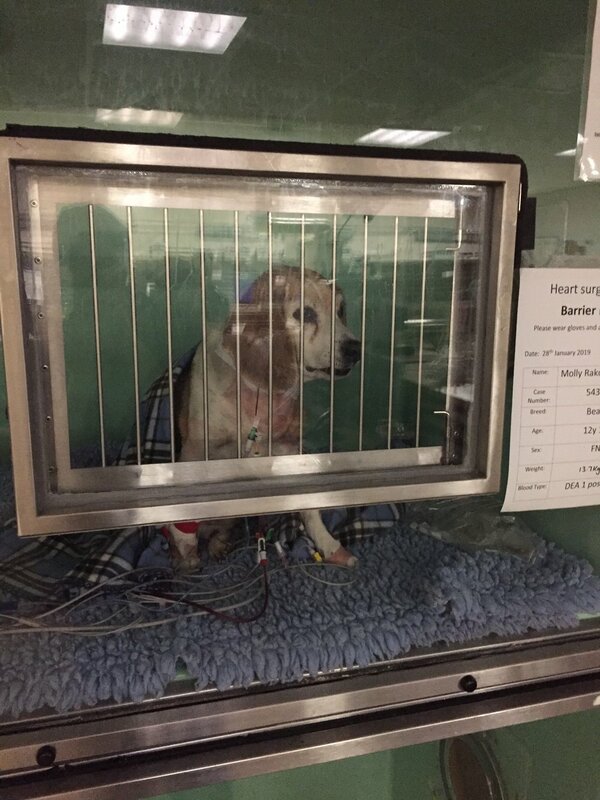 She had successful heart surgery on January 28 and four hours after her surgery, I received a picture of her sitting up and alert in her ICU cage. She was looking around. The next day when we were able to visit, she came strolling out on a leash to the waiting room to meet us, tried to escape RVC by making a break out the exit door, and gobbled up a plate of chicken. Her post-surgical recovery was mostly smooth with one bump in the road on the Friday after surgery when her heart rhythm became abnormal. RVC took immediate action and she was temporarily put back into the ICU and by Sunday she was back to her old self. The entire RVC team was amazing throughout Molly's recovery and Molly, who has always been very frightened of vets, came to love her life-saving surgeons and her nurses (Sarah and Allison), as well as the ICU nurses at RVC who gave her such excellent care. She was discharged the Wednesday after surgery with a significantly smaller heart. She was also off of Enalapril and Lasix and remained only on her Vetmedin dose. She had a great appetite and was very excited and eager to walk around Harpenden where we stayed in the UK. We flew home Saturday morning and she had a very smooth recovery process with no complications. On March 4, 2019, we visited Dr. Simon Swift at University of Florida Gainesville (we split our time between Florida and PA). Molly had only a soft murmur and mild regurgitation and her heart had shrunk back to the upper end of the normal range. The surgery was pronounced a "great success." Molly was also taken off the Vetmedin and is no longer on any heart medications. We are forever thankful to the RVC team for saving Molly's life and to Dr. Simon Dennis for advising that we contact RVC and for helping us to facilitate the surgical option, as well as to Dr. Dennis and Dr. Swift for keeping Molly stable leading up to the surgery.